It's been such a dry warm summer this year that the mushrooms around here are rather late appearing, although I did see a clump of the red spotty ones that I normally collect a specimen from just too late as they had been destroyed by somebody kicking them over. These very delicate specimens were growing in the grass at the campsite we stayed at recently near Mont St Michel. 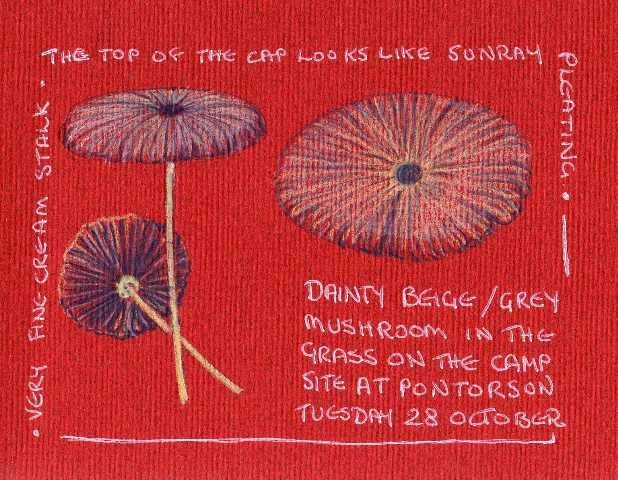 They grew in a day in the grass and were very pretty to draw with their pleated tops and pale mauvy grey undersides. Your mushrooms look very much like ones I noticed here recently. Very pretty. Beautifully portrayed tiny mushrooms in my SiN feed - it must be Valerie! I think these are possible a type of what we call 'parasol'. Gorgeous! Thanks Jules, these were much smaller and more fragile than the edible parasols we have here. Certainly not even a mouthful if you were hungry!